A stamp pre-inked with black ink and a flat impression area sized to match our round seal embossers. When pressed lightly over an embossed impression, it darkens the raised areas for increased readibilty. 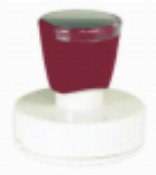 Use Xstamper Refill Ink only to re-ink your stamp pad. Re-Inking Instructions: Pop off top cap handle and in the center place 3-4 drops of Xstamper Refill Ink in the center of the stamp.